IF YOU EVER BOOKED AN EVENT HERE AT LONE HICKORY, YOU SPOKE WITH BETH KIDD. HER COWBOY HUSBAND, CHET, SUFFERED SEVERE HEAD TRAUMA IN AN ACCIDENT WORKING CATTLE IN EARLY MAY. THEY HAVE A LONG ROAD AHEAD OF THEM. 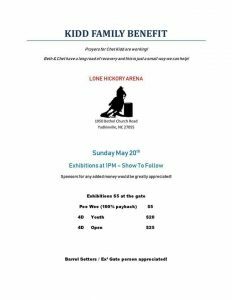 THEY HAVE ALWAYS BEEN THERE FOR OTHERS, WILL YOU HELP US RETURN SOME LOVE… FIRST, PRAY!… THEN COME OUT AND BID ON AUCTION ITEMS, SHOP THE VENDORS AND EAT AT THE ARENA GRILL, AND HAVE A GREAT TIME FOR A GREAT CAUSE.